Riding Motorized Scooters in HOA Common Areas? Asked – We have continued problems with unruly, unsupervised, and destructive children in our community’s common areas. They ride motorized scooters, skateboards, bikes, etc. all throughout our walkways and have collided with people and animals on several occasions. Our property manager said that nothing can be done because any rules aimed at restricting such conduct would be “discriminatory” against children. What are our HOA’s options? Answered – It is true that Federal and California courts have applied anti-discrimination laws, such as the Fair Housing Act, to homeowners associations (HOAs) in order to prohibit them from discriminating against families with children. There are exceptions, however, in instances where a seemingly discriminatory policy/rule is designed to address legitimate health or safety concerns. 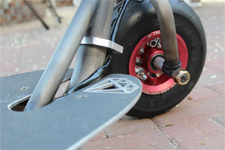 Thus, for example, the HOA should be able to adopt a set of operating rules restricting scooters, skateboarding, bicycling etc. in certain common areas where those activities represent a significant threat of personal injury or property damage. Provided that those rules do not single out “children,” but instead apply to all persons in the community, they would likely be deemed reasonable and enforceable pursuant to Civil Code Section 4350. Additionally, most sets of CC&Rs contain provisions restricting acts which constitute a nuisance. Thus, even in the absence of specific operating rules of the type referenced above, your HOA may still have the ability to address the activities at issue through enforcement of the nuisance provision contained in its CC&Rs. Your HOA’s Board of Directors should evaluate the situation and determine if there are legitimate health and safety concerns resulting from the activities and/or if those activities are resulting in a violation of the nuisance provision contained in the CC&Rs. If the Board makes a good faith determination that the HOA should take action, it should consult with the HOA’s attorney for guidance as to what enforcement options are available, and how the HOA may adopt or modify its operating rules to restrict specific activities in the common areas. Blog post authored by TLG attorney, Terri Morris.